The Generate Terms section allows you to define one or more Term Groups, which generate / produce Taxonomy Terms. Each Term Group you create is unique, and comprises of the Keywords, content and generation settings, such as the Taxonomy and number of Terms to generate. You might use multiple Term Groups for different Taxonomies on your web site. For example, you might have one Term Group for generating Categories about the services your business offers for a list of locations, and a second Term Group for Post Tags that can be used for your blog posts. 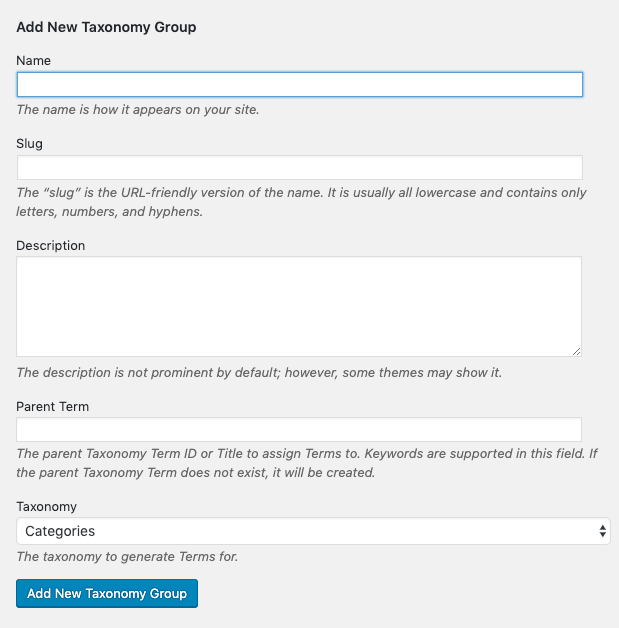 From your Term Group, you’ll use the Generate functionality to then make Page Generator Pro generate your Taxonomy Terms (Categories, Post Tags and/or other Taxonomies registered on your WordPress web site). Only need to generate a few Terms when generating Content? 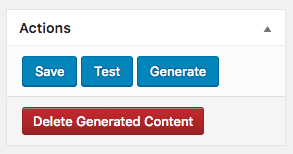 The Generate Content section allows for Taxonomy Term Names to be dynamically generated along with the content. To access your Term Groups, click on the Page Generator Pro menu entry in the WordPress Administration, and then click Generate Terms. Name: The Term Name. Keywords are supported here. Slug: The Term’s Slug. Keywords are supported here, and the slug is auto generated if left blank. Description: Optionally define the Term Description. Some Themes output this when viewing a Term. Parent Term: Optionally define the Parent Taxonomy Term ID or Title to assign generated Terms to. Keywords are supported, and the parent term will be created if it does not already exist. Taxonomy: Select the Taxonomy to generate Terms for. Click the Add New Taxonomy Group button when done. The Taxonomy Term Name for each generated Term. Supports keywords, which can be inserted manually. A different keyword data item is then chosen for each generated Term. The Taxonomy Term’s Description for each Term. Also supports keywords, which can be inserted manually. The Description may be used by your Theme and SEO Plugins. Automatically generated, but again can be manually specified with keywords. A different keyword data item is then chosen for each generated Term. Slugs must only contain alphanumeric characters, dashes, and/or underscores. No spaces. We don’t recommend using Spintax here, as it may result in multiple Terms having the same Slug, causing confusion when you expect more content to have been generated than the actual result. This is by design, as each Term must have its own unique Slug. Don’t see the Parent Term option? It’s only displayed when you choose a Taxonomy that supports hierarchical (parent / child based) Terms. If the chosen Taxonomy (see below) is hierarchical, you can optionally specify a Parent Term. When specified, all generated Terms will be assigned as children of the given Parent Term. Keywords can be used here. If the Parent Term already exists as a Term, the existing Term will be used as the parent for all generated Terms. If the Parent Term does not exist as a Term, a new Term will be created. All generated Terms will then be assigned to the newly created Parent Term. Allows you to specify the Taxonomy that you want to generate Terms for. No: Existing generated Terms will not be overwritten. No. Terms: Choose the number of Terms to generate. If zero or blank, Page Generator Pro will attempt to produce all possible combinations based on the above generation method. 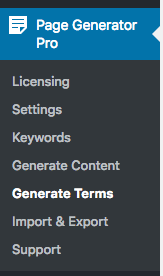 If the Number of Terms settings exceeds the possible maximum number of unique Terms that could be generated, Page Generator Pro will honor the possible maximum number of unique Terms instead. This is to ensure that no duplicate content is generated. For the Random method, a number must be specified. If no number is specified, 10 Terms will be generated. Save: This saves the settings on the Generate screen. Test: This saves the settings on the Generate screen, and creates one test Term. Generate: This saves the settings on the Generate screen, and generates the required number of Terms. Delete Generated Terms: This allows you to delete all existing Term(s) that were generated by this Group. This is useful if you made an error, and need to replace your existing Terms with revised content. Before testing or generating Terms, we recommend reading the rest of the Documentation covering Methods, and Spintax. These are all useful to help configure truly valuable, unique Terms.